As you may know, asthma rates have gone through the roof in the last 30 years. So researchers are trying to find out if antibiotics are to blame. These researchers, from the University of Manchester in the U.K., are asking, "What came first — the deficient immune system or the antibiotic?" And what they found may have a big impact on asthma rates. A study published four years ago in the American Journal of Epidemiology found that when doctors give babies antibiotics, their risk of developing asthma before the age of six years increases by 50%! The explanation offered for this is that antibiotics kill off many of the beneficial bacteria we have in our intestines. But our immune systems are dependent upon these bacteria to function properly. So the theory has been that the antibiotic use leads to deficient immunity, which leads to more infections, and that leads to more antibiotics. All of which leads to asthma later in life. But is that what is really going on? The U.K. research team, led by Prof. Adnan Custovic, analyzed the data from more than 1,000 children from birth until the age of 11. They looked at their medical records to determine how often doctors gave them antibiotics and how often they ended up with asthma. Then they did tests on their immune cells to see how effective they were against many of the common infections that kids come down with. These infections included the viruses rhinovirus and respiratory syncytial virus (RSV) and the bacteria Haemophilus influenza (H-flu) and Streptococcus pneumonia. And finally they looked at variations in the genetics that relate to immune system function. Here's what they found. "We noted significantly higher risk of physician-confirmed wheezing after antibiotic prescription." Basically a 70% increased risk for any kind of asthma case after the use of antibiotics. When it came to the severe cases, it got much worse. They had a 126% increased risk. And the risk of being admitted into the hospital for asthma after antibiotic use was even higher — 164%. But that's not all. The researchers also found out that the children who received antibiotics in infancy had significantly lower levels of cytokines. These are the messenger molecules that the immune system uses against infections. And they discovered differences in two genes near the chromosome 17 region that were linked to increased risk of antibiotic prescription in early life. So what seems likely is that it may not actually be the antibiotics that are causing the increased chance of asthma later on. It may be that there are children out there who are born with a deficient immune system. And because of that, they get more infections and are hence more likely to get antibiotics. But how surprising is this? Not very. Obviously there are going to be some people who are born with bomb proof immune systems and who will never get asthma. And there are going to be others whose immune systems are not nearly as good. This is completely predictable. The point is this. Instead of giving kids who get infections a never-ending stream of antibiotics, why not attack the real problem and give them help for their immune systems? That's not going to make Big Pharm happy, but it sure makes sense. What kind of help? First, get them on a diet free of packaged, processed foods laden with sugar and chemicals. Second, test them for food allergies. This can easily be done with a blood sample. Eliminate any foods that they are allergic to. Third, put them on a good multivitamin-mineral that also has immune system support. I designed Super Immune QuickStart as a powder because that makes it easy for kids and seniors alike to take it. QuickStart has therapeutic doses of the herb astragulus. Astragulus increases the cytokines that these researchers found so lacking in the kids who needed all the antibiotics. It also has many of the nutrients that kids can easily become deficient in. Remember, if your immune system is bomb proof, it may not be a problem for you if you are lacking in zinc or bioflavenoids. But if you are born with a slightly shaky immune system, it might make a big difference. 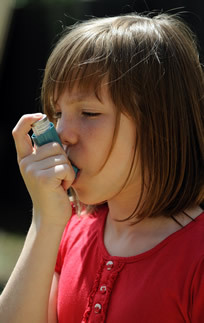 According to the American Lung Association, around 7.1 million children in the U.S. have asthma. Another 18.8 million adults have the disease. That shows how long this problem has been going on. And the research is clear. Many of these cases are caused by deficient immune systems leading to the overuse of antibiotics. So if that's you, your kids, or grandkids, don't just keep getting the antibiotics and making matters even worse. Treat the immune system before problems develop. Semic-Jusufagic A, Belgrave, D, Pickles A, et al. Assessing the association of early life antibiotic prescription with asthma exacerbations, impaired antiviral immunity, and genetic variants in 17q21: a population-based birth cohort study. The Lancet Respiratory Medicine, Early Online Publication, 15 May 2014.